A magnificent away victory in darkest Kent! 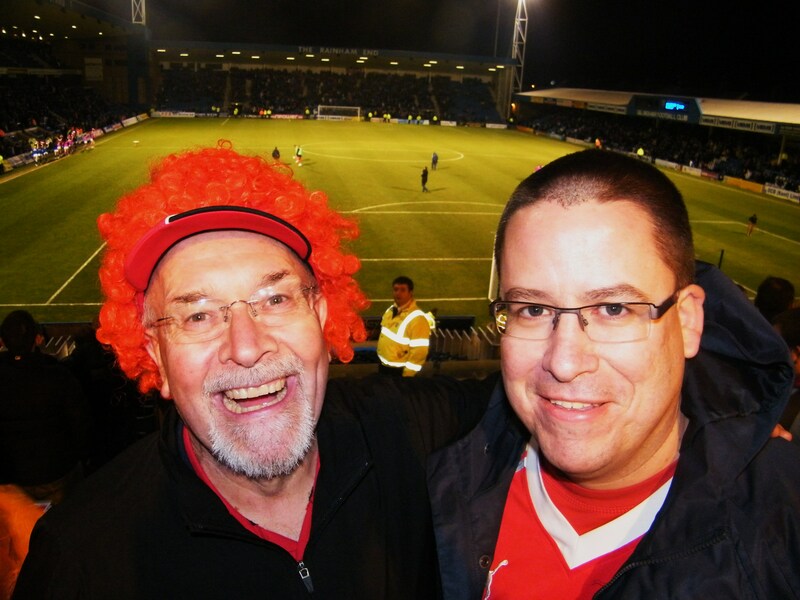 325 Town fans made their way to the Priestfield Stadium Gillingham last Tuesday and were rewarded with a fine performance. 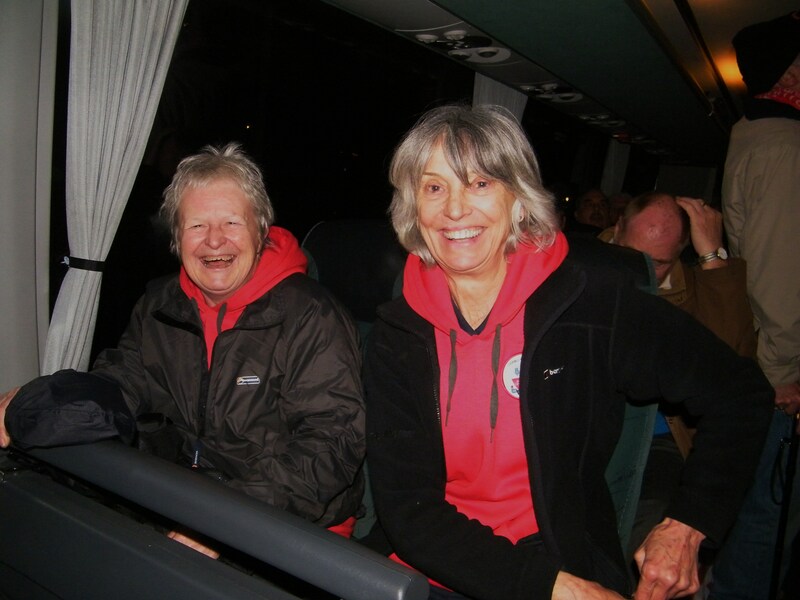 2 CTSA coaches left the Broadfield at 4.30pm and steady progress was made around the M25 and M26 arriving around 6.15pm. CTSA Vice Chair Paul Prendergast was very disappointed that the chippy opposite the away fans pub wouldn’t take his collection of 1p, 2p and 5p coins but otherwise a good time was had by all! The Brian Moore all seated away stand offers a brilliant view of the action but being of a temporary construction (and without a roof) it did tend to move about a bit, which encouraged some of the younger element amongst our support to jump up and down even more vigorously than usual, frightening those who are a little scared of heights! As I used to live in Kent as a boy and would often visit Prestfield in the late 70s, I have previous experience of the old place. Trust me, it was a dark and scary experience in those days especially standing in the packed home terrace. 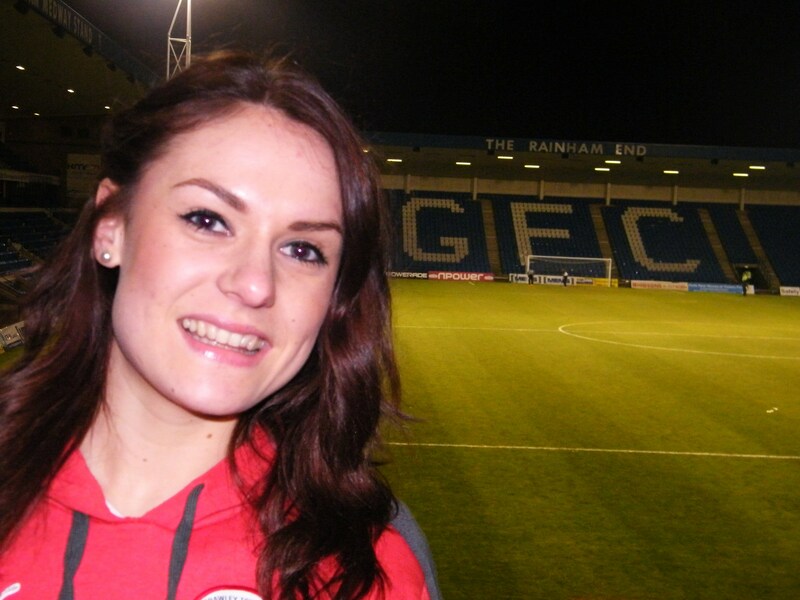 It was a million miles away from the superb facility that Gills fans enjoy today. So the away section may move around a little, but all in all it’s still a vast improvement! Would you trust the two be-wigged gentlemen with your financial affairs or your gas supply? No, us neither! With the classic Red v Blue taking place under clear skies, bright floodlights and mild temperatures everything was in place for an exciting evening. To be honest a pretty lifeless 1st half passed by without goals or much incident (apart from a Fadz header that some say may have crossed the line but we were too far away to see properly), and with our Reds in control. At the break Mitch Whiston of Maidenbower who was enjoying his evening with 3 friends said “I think the boys have played quite well in that first half, whilst not a classic so far I think we can go on and get a positive result”. 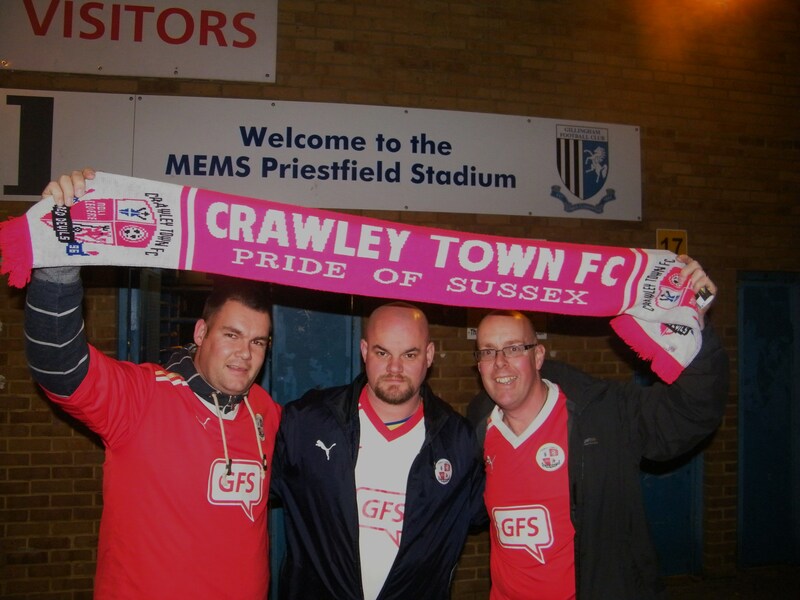 ‘ He added, “its good to see so many Crawley fans here especially as it is midweek”. 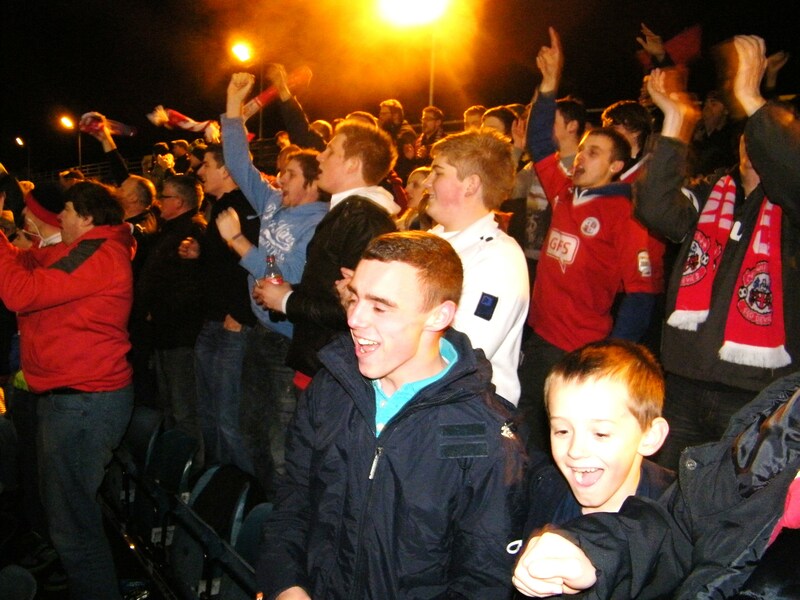 Reds fans didn’t have to await long in the second half for the match to explode into life. On 50 mins midfielder Danny Bulman stole 5 yards in the box and calmly slotted a left foot shot past an advancing keeper. The away end erupted! It could have been double delirium 15 mins later as Hope Akpan headed in from close range. Unfortunately an offside flag had been raised, but nobody was quite sure who was offside- we didn’t think it was Hope. As time ticked away Gillingham had 6 successive corners all of which were well defended. 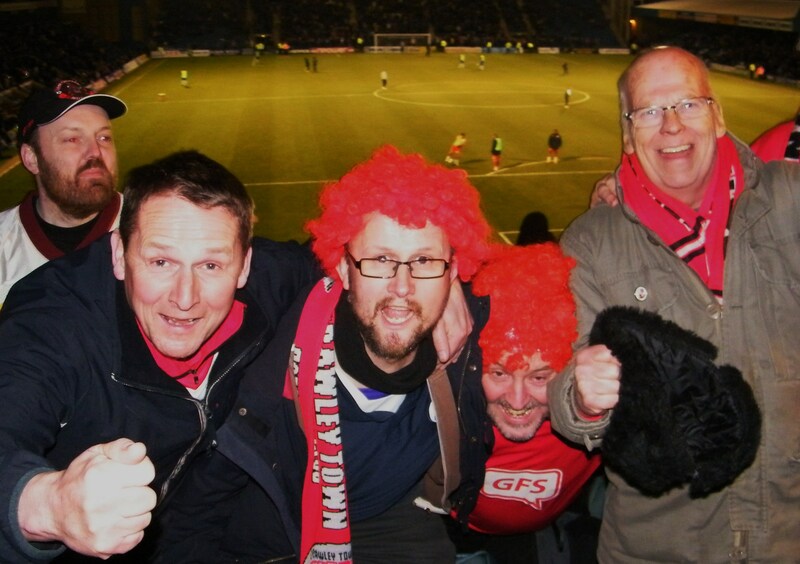 It was heart stopping stuff but Crawley clung on for a famous away victory and 3 massive points. That’s now six away league victories for the club. 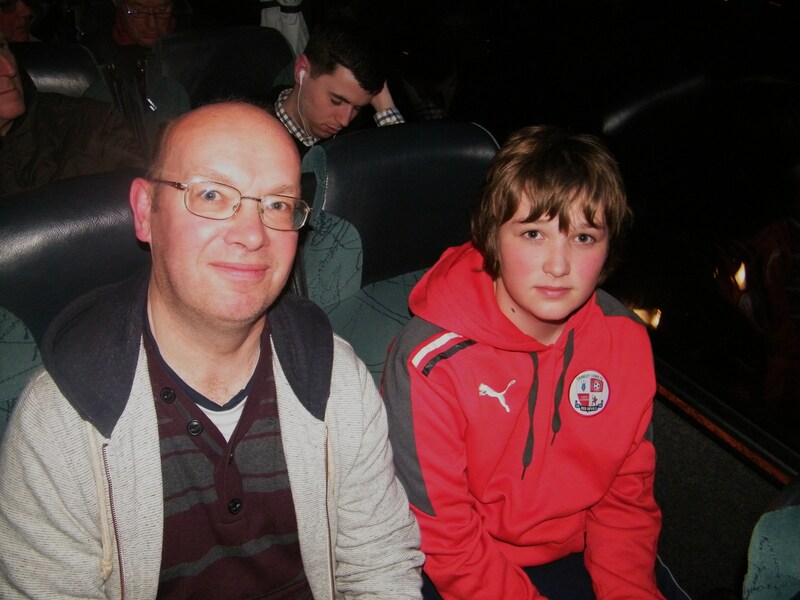 On the short hop home I caught up with Dave and son Dean Griffin (14) from Burgess Hill. Both terrace season tickets holders and CTSA members. 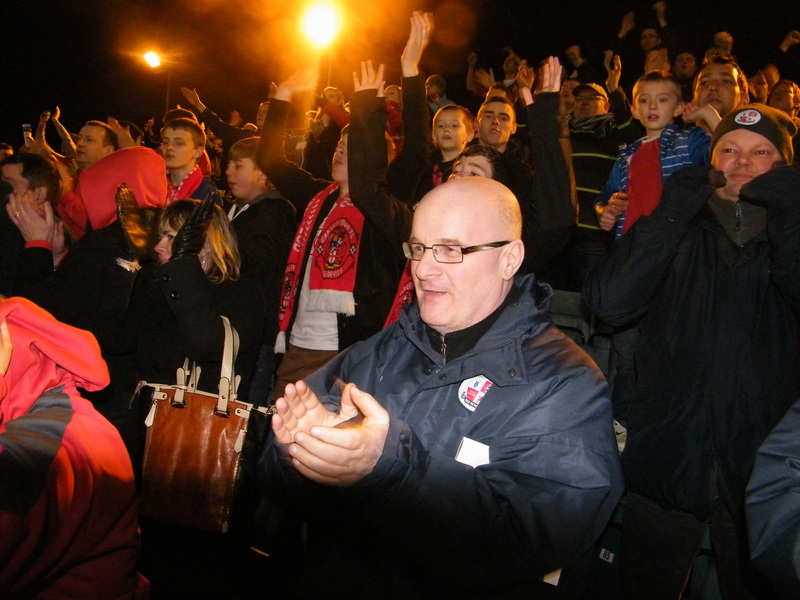 I was stunned to learn that there were other CTFC season tickets holders in my home town -perhaps Burgess Hill is really a hotbed of CTFC devotion and I’ve missed it! 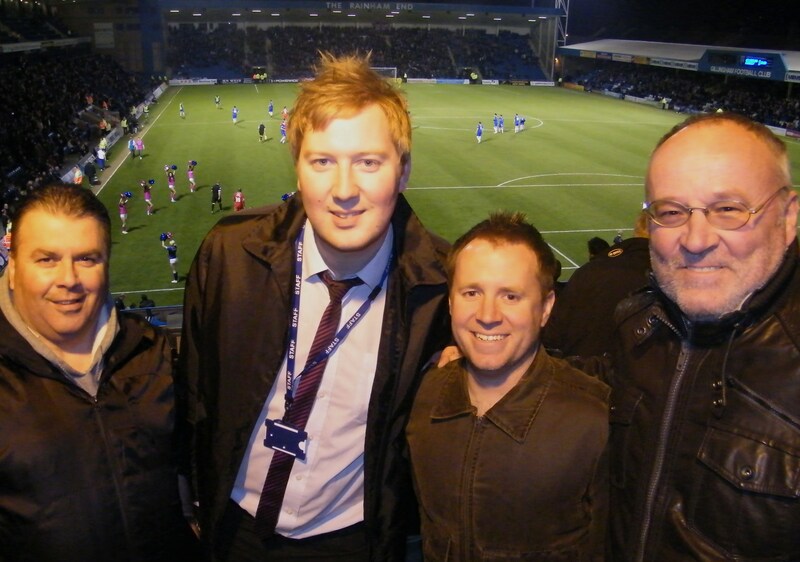 Dave said, “we had a great view of the action this evening and it’s clear that Priestfield has been tarted up. It really is a lovely ground.” As to the action he said, “it was nip and tuck 1st half but the game turned when Bulman scored an excellent goal. I think we just about deserved to win the game and we were both over the moon at the final whistle”. He added, “it’s really great to see the midfield chipping in with goals. Torres on Saturday and Danny tonight, if we keep this run going then automatic promotion could well be on the cards”. He finished by saying, “we have been to a few away games this season and are impressed with CTSA, they are a friendly bunch and provide good value for money”. The public faces of CTSA Travel. Terrified? Us too! 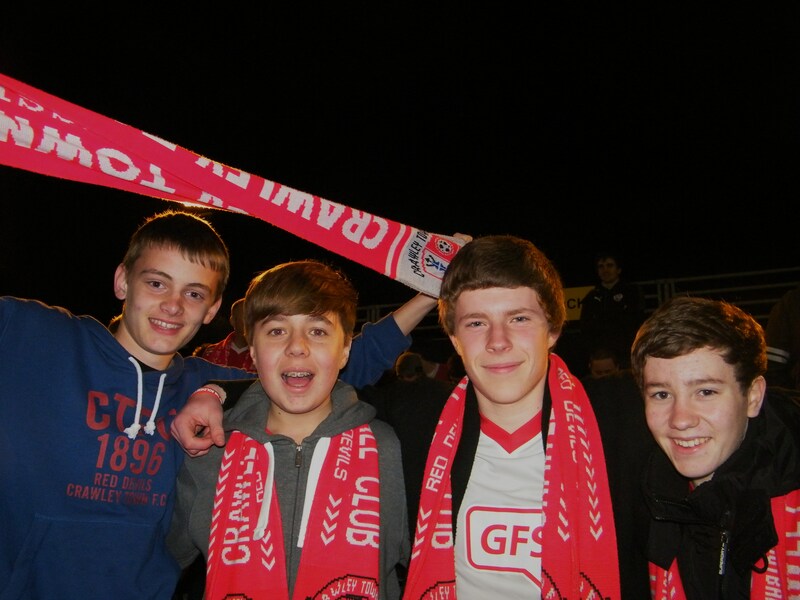 After some long journeys this season it felt like no time at all before we were back at the Broadfield Stadium. Thanks to Clarks for another faultless trip. 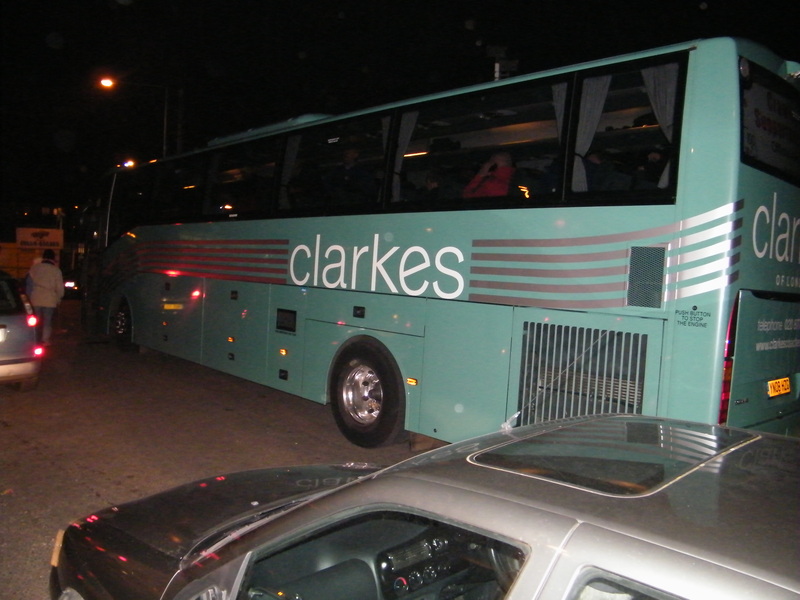 Coach 2 driver Mark revealed, “I managed to see the game this evening and it was very enjoyable”. When he’s right, he’s right! Two respectable pillars of the community having far too much of a good time! Stop that immediately!